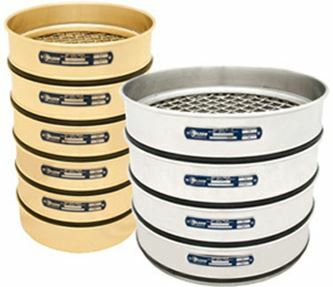 Gilson Wet-Vac® Sieve Shakers - Gilson Co. The Gilson Wet-Vac® Sieve Shaker is a self-contained particle sizing system for mainly wet sieving applications to assure particle separation efficiency. The innovative design includes rotary spray distribution, water recycling, vacuum assist and full vibration control. Wet-Vac® filtration enables complete recovery of fines, and separate modes of dry, wet, or dry-to-wet sieving methods enhance flexibility and improve test accuracy. Wet sieving is especially useful for coal and mining/minerals, marine sediments, soils, pipeline slurries and other non-soluble materials. Wet-Vac® tests closely simulate actual production conditions in wet-process industries. A rotating spray bar in the sieve cover gently saturates the materials, promoting gravity flow of fines through the sieve stack while preventing agglomeration. An upward spray from below allows for constant water flow. A vacuum of 2in (50.8mm) of mercury is applied throughout the test cycle to further assist passage of fines. Powerful electromagnetic vibration with amplitude control disperses material for increased sieving speed and accuracy. Fines are retained on filter paper secured in a special holder that permits the paper to be changed during a test cycle if necessary. Water is recycled through a 7gal (26.5L) holding tank and pressure is adjustable to approximately 35psi (2.4bar). Valves and fittings also permit direct connections to water tap and drain, for once-through operation. Controls, gauges and indicators for water, vibration and vacuum are situated for easy access on the control panel. The built-in timer tracks total operational time up to 99 minutes, even when interruptions are necessary. The custom-welded stainless steel cabinet houses the water tank, pump, vibrating assembly, valving and other components, and is mounted on locking casters. 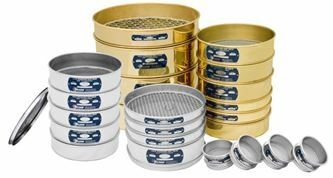 WV-1 models accept 12in (305mm) sieves. WV-2 models accept 8in (203mm) sieves. WV-3 have cover assemblies and lifting rings to accommodate 8in (203mm) and 12in (305mm) sieves.